Lamco Systems has been serving Merrimack Valley since 1967, and in that time, we’ve helped a great number of people who were experiencing problems with their furnace. As the technology has improved over the past 50 years, we’ve seen advances in heating systems that make them easier to operate and more energy efficient, but that doesn’t mean that things don’t go wrong. Perhaps the worst issue a homeowner can have with their furnace is when the system quits in the middle of a cold winter night. When that happens, it’s important to have a plan in place so that you can stay warm until your HVAC specialist arrives. At Lamco, we proudly provide 24-hour emergency service, so you won’t have to wait very long! The first thing you should do when your furnace quits in the middle of the night is to call an HVAC expert. As we mentioned above, we offer 24-hour emergency heating repair, so you won’t have to wait for hours for someone to arrive. This also removes the burden of checking the system yourself, which can save you from having to venture into the basement or utility closet at 1:00 in the morning. If you have a gas furnace, and you smell gas, leave the property immediately and call your utility provider before you call anyone else. It could save your life! The temps in the Merrimack Valley area can drop quite low during the winter, which means that the temperature inside your house can drop quickly when the furnace isn’t working. 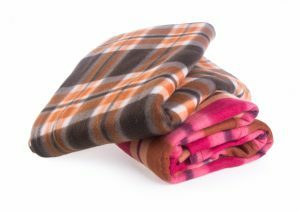 Make sure you know where your warm blankets are, and it can be a good idea to layer up with sweaters and jackets to stay warm and cozy. If you have a working fireplace, light it and let the heat permeate the house. Electric space heaters can also be good, but make sure that you don’t plug in too many in one area, as you can overload the circuit breaker. One of the biggest issues that can arise from a broken furnace is frozen bathroom and kitchen pipes. Opening the cabinet doors below your sinks can help prevent the pipes from freezing. If you have a space heater to spare, consider using one in or near the bathroom or kitchen. It can save you from serious plumbing problems and costly repair bills. The plumbing should be okay for a day or so, but it’s better to be safe than sorry. Until we can get your furnace working again, it’s important to make sure that no cold outside air is finding its way inside. Check your doors and windows for drafts, and if you find any, take the proper measures to stop them. Close the blinds and drapes, and hang blankets or stuff towels under the doors to keep those cold drafts outside. Also, make sure you minimize the number of times you open the doors, since every time you do, cold air enters the house. 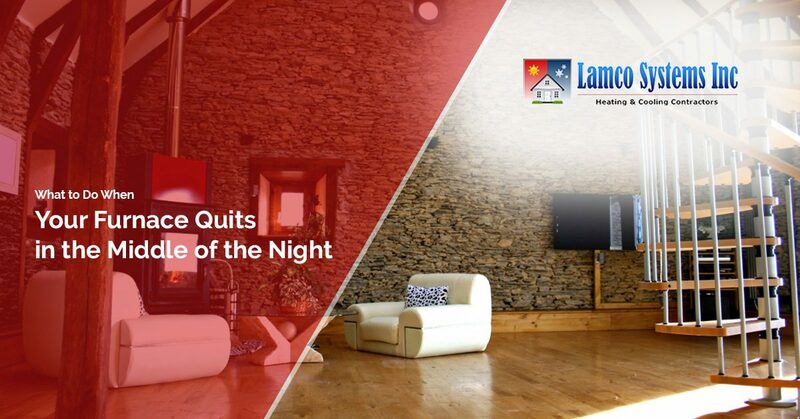 If your furnace quits in the middle of the night, contact Lamco right away and we’ll be there to take care of the problem. We know that it can be frustrating to be left freezing in the middle of the night, but we’ll arrive as soon as we can to get your system working once again. By taking the steps we’ve listed above, you and your family should be able to stay warm and cozy until we get there. We don’t charge overtime for emergency visits*, and we won’t leave until we know everything is working as it should. If you need emergency heating repair, call us at (978) 674-8837 or (978) 649-3868 right away. If you need furnace repair or installation during regular business hours, you can use the form below to schedule an appointment.